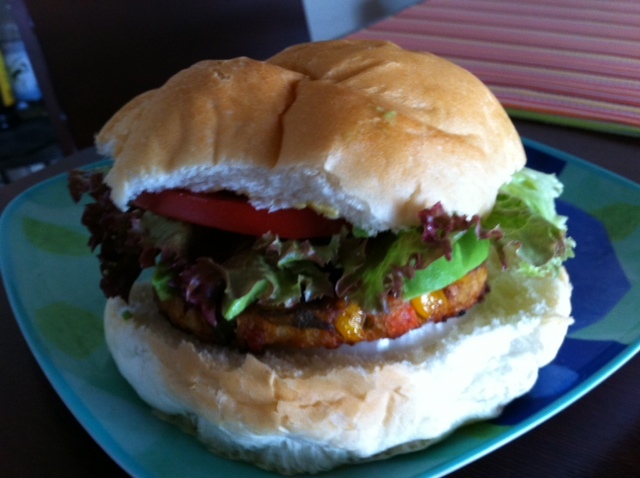 Veggie burgers: not boring. This is Trader Joe's Vegetable Masala Burger, a vegan patty sold frozen made of potatoes, carrots, green beans, bread crumbs, bell peppers, onions, corn, ginger and a significant bit of spice. It's kind of the filling from a delicious samosa molded into burger form. So it's good, and we don't have to do much to make it so ... just grilled it up and dropped it on a kaiser roll with red leaf lettuce, tomato, red onion and spicy garlic mustard. Just another reason not to hate TJ's.